Good afternoon y’all. Happy Midweek 🙂 . I’m focusing today’s blog on verses 6 – 7. A seal confirms a deed is original and authentic. It’s a stamp of ownership and authenticity on something. She’s asking her lover to claim her completely as his own; to put his stamp of ownership on her heart so she can be completely his and his only. In the same way Jesus has put His seal on us. He has claimed us as his own completely and He is jealous for us. The love of God is as strong as death. Just like nothing escapes the grasp of death, so it is with God’s love: nothing can escape the grasp of His love. His love never gives up on us. It’s a jealous kind of God. In exodus 34:14 God says “...for the LORD, whose very name is Jealous, is a God who is jealous about His relationship with you.”. Many waters cannot quench God’s love for us. Romans 8:35-39 comes to mind immediately. Nothing can ever separate us from God’s love. His love is so amazing and unconditional. Not even trials or death can separate us from God’s love towards us. “Set me as a seal upon thine heart, as a seal upon thine arm,…. These are still the words of the church, speaking to Christ as she walked along with him, as the affixes in the Hebrew text show; in which she desires to have a fixed abiding place in his heart; to continue firmly in his love, and to have further manifestations of it; to be always remembered and supported by him; to be ever on his mind, and constantly under his care and protection; and to have a full assurance of interest in his love, and in his power, which is the sealing work of his Spirit, Ephesians 1:13. The church’s desire is, that she might be affectionately loved by Christ, be deeply fixed in his heart, be ever in his view, owned and acknowledged by him, and protected by the arm of his power“. Thanks for joining today. Please feel free to share your thoughts on the chapter. 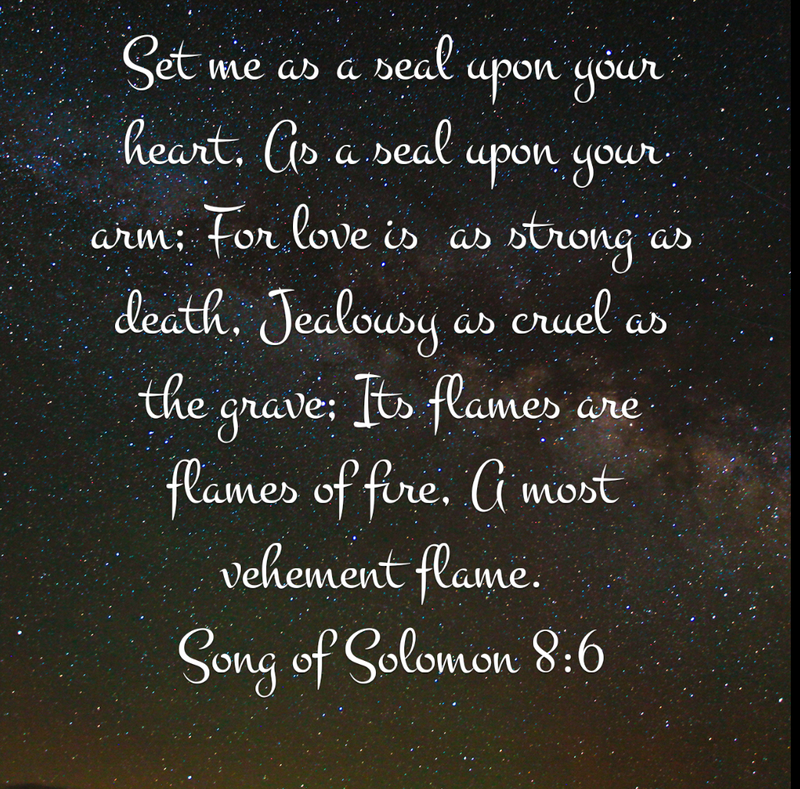 Song of Solomon 7 – Oh how he loves us …. Good evening y’all. 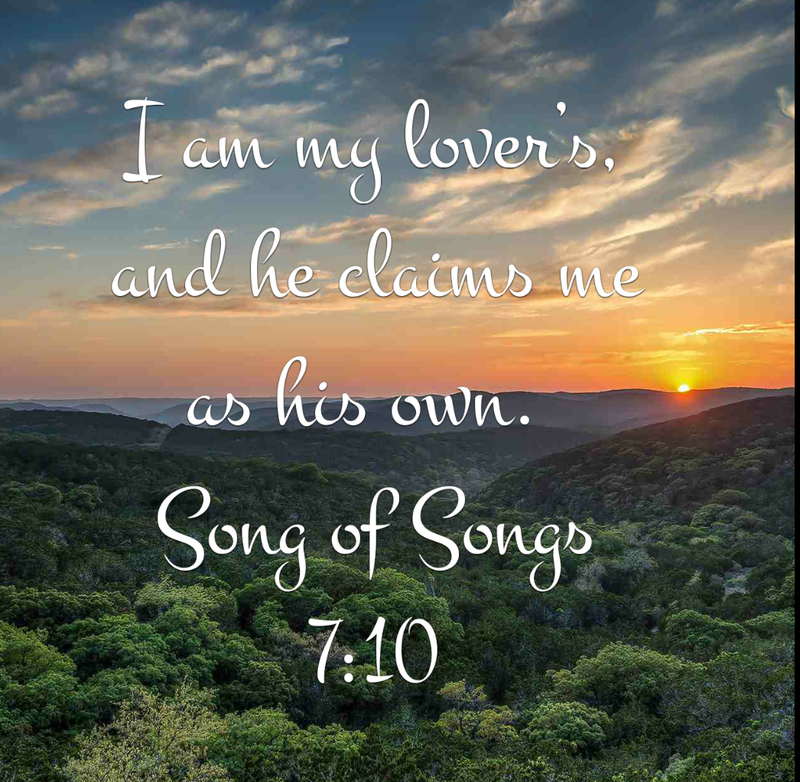 Today we are studying Song of Solomon 7. Reading this book for me, is a reminder of how much I am loved by God and how He longs for me and desires me to revel and rest in His love. I really love verse 10. This is absolutely awesome 🙂 🙂 . We are Gods own priced possession and He claims us as His own. Not sure there is anything that can beat the feeling of knowing that God himself claims us as His. We are His delight and the apple of His eyes 🙂 . He has loved us with an everlasting love and has drawn us nigh with his loving kindness. We love Him because He first loved us. He showed His love for us in that while we were yet sinners, He died for us. So amazing !!!! So what should our response be to this love that God has shown us? Does this love give us the liberty to live our lives anyhow? No it doesn’t and our response should be obedience. I am reminded of the scripture that says: We have been bought with a price which means all that we are is completely Gods. “For ye are bought with a price: therefore glorify God in your body, and in your spirit, which are God’s” (1 Cor 6: 20 KJV). The least we can do for God is to reciprocate the love He has shown us through our obedience and worship. Jesus said in John 14:15 that if we love Him, we will obey His commandments. I pray Gods love will be real to us in our daily lives; that the love will motivate us to live for Him and serve Him completely with all our being. In Jesus Name, Amen.